yourFXguide-Moving Average and MACD Train trading system is one of the most effective trading systems I have ever found. This post explains the technique to identify the short entry signals with Moving Average and MACD Train trading system more effectively. 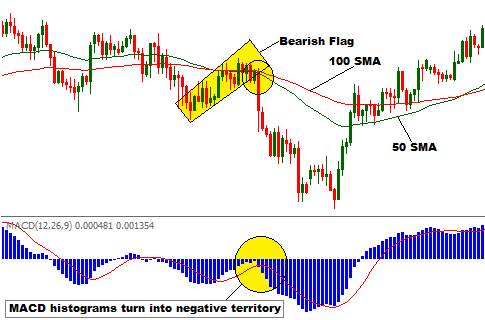 Before reading this post, you should be introduced with the basic to Moving Average and MACD Train trading system and the way to identify the entry signals with the system. Click here to read the first post I wrote on Moving Average and MACD Train trading system. 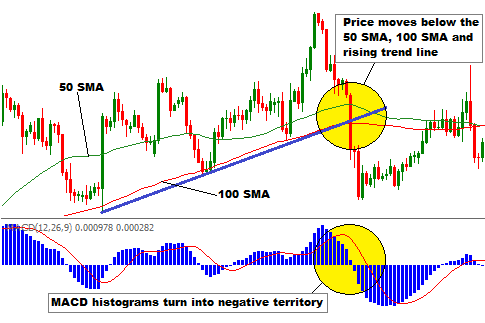 If you already read my first post about Moving Average and MACD Train trading system, you came to know that a short entry signal with this trading system is found when the price moves below the 50 SMA and 100 SMA, and MACD histograms turn into negative territory. Okay !!! Now let see how we can identify the short entry signals accurately with Moving Average and MACD Train trading system. 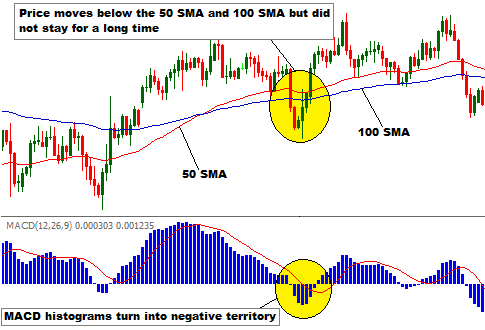 Some times we see that price moves below the 50 SMA and 100 SMA, and MACD histograms turn into negative territory, but price does not stay below the 50 SMA and 100 SMA for a long period of time. This type of situations are most commonly found when the MACD turn into negative territory first time after staying in positive territory for a long period of time. In such cases, the price moves below one of the SMA indicators the MACD histograms turn into negative territory and make a small loop like formation in negative territory and again turn back to the positive territory. Traders have to put extra care in placing a short entry when MACD histograms turn into negative territory first time after staying for a long period of time in positive territory. 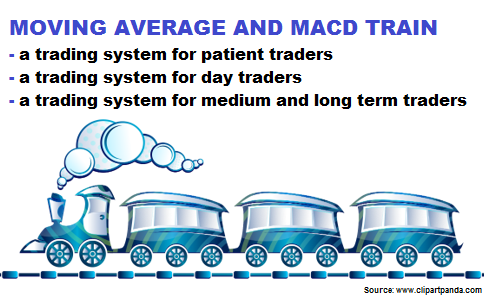 With Moving Average and MACD Train trading system, sometimes a short entry signal is found but the short entry does not be profitable as expected. One of the such situations is illustrated in above price chart. We can see the distance between two SMAs is relatively wider, and the MACD histograms turn into negative territory when price moves below the first SMA closer to the price. In such cases, a short entry may not be that much profitable as expected. 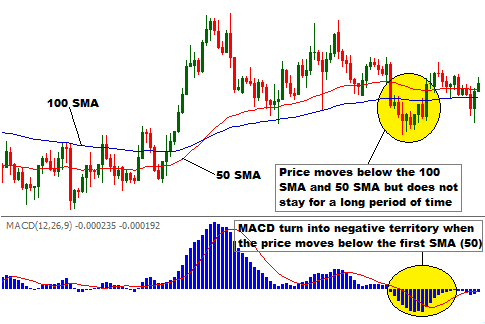 A very profitable and accurate short entry signal can be found with Moving Average and MACD Train trading system when the price moves below the 100 SMA and 50 SMA, and also breaks any of the price chart pattern. Here in the above illustration, breakout of a bearish flag pattern happened. Another effective short entry signal with this trading system can be found when the price moves below the 50 SMA,100 SMA and a rising trend line. At the same time MACD histograms turn into negative territory. 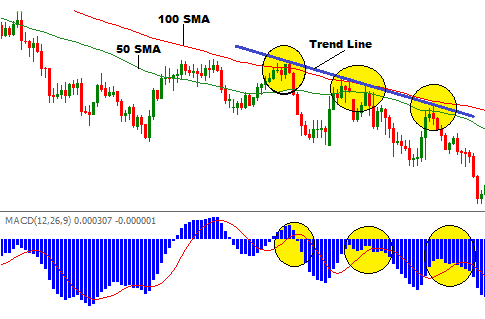 With this trading system, a falling trend line can be used to find some accurate short entry signals. The short entry signals are found when price moves below the 50 SMA and 100 SMA after kissing the trend line. The MACD histograms must turn into negative territory or grow longer in negative territory. In bottom line, the above techniques can dramatically improve the ability of a trader to identify the profitable short entry signals with the Moving Average and MACD Train trading system. If you have any question regarding this post, you can drop it into the comment section below. I generally respond to your comments within 24 hours.